Bae-Yul can show you Bhutan in varying ways to suite both the time-constrained busy exective as well as the leisurely wanderer. We have tailored programmes ranging from four days to a fortnight, within which you can visit places of cultural interest or savour the wanders of Bhutan`s rich and prestine wild, or simply seize the opportunity to enjoy both. Our short tours take you to the main cultural and social hubs, while the longer programmes takes you a little beyond. In any event, a visit to any place in Bhutan is a rare treat, an experience worth your time, and certainly one you will cherish for a long. A sense of timelessness, and the social and cultural aroma that is distinctly Bhutanese, have never failed to nourish and inspire the spirit of a visitor. Bae-Yul generally conducts its guests to Paro, Thimphu, Punakha, Trongsa, Bumthang and Trashigang. These districts share many common features: they are all situated in the cultural heartland. ; each sports a `dzong` (castle fort) which serves as the seat of local and a centre for religious learning. ; and each has an emerging modern township which provides every basic modern consumer good. Paro is the visitor`s entry point into the kingdom when arriving by air. The country`s only airport lies amidst the terraced fields and farm houses of this picturesque valley. Similarly, the national museum is also here, housed an ancient watch tower by a hillside, overlooking the Paro Dzong, the Ugyen Perli Palace and the valley. Paro also boasts of the 7th century Kychu Monastery and the famed Taktsang, the tiger`s nest monastery which clings precariously by the side of high mountain cliff. On the way to Taktsang lies the ancient fort of Drugyel, now in ruins. 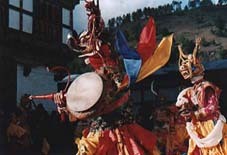 The annual festival of Paro Tsechu which take place in April is a major attraction. It is a religious, cultural and social event lasting for a week. The people of the valley dress in their finery and gather at the Paro Dzong to watch religious and cultural dances and other performances, day after day. The festiv spirit is strong and pervasive and leave many a visitor enchanted. Thimphu is the capitol of Bhutan and is the seat of the royal government, housed in the manmoth Tashichho Dzong. The Tashichho Dzong is also the residence for the country`s head and abbot and his central monastic body during the summer. Like all the other valleys, Thimphu is essentially a farming valley, but now a young bustling downtown is growing modern by the day, alongside deeply modern etched spiritual and cultural traditions. Thimphu has its share of historic sites, such as the Semtokha Dzong , the first fort build by the Shabdrung, Bhutan`s first spiritual and temporal ruler. Thimphu Domchey, the festival of this valley usually takes place in the month of September when the valley floor is coloured gold with ripening paddy. 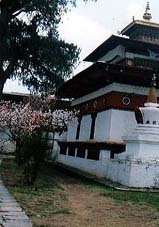 It is only a 90 minute drive from the airport in Paro. Punakha was the old capital of the kingdom. The Punakha Dzong was built in 1637 sits massively at the confluence of the Pochhu and Mochhu rivers. In Bhutan`s past this dzongs has been the scene of many a fierce and victorious battle with invading Tibetan armies, as well as the signing of peace treaties with British India. The three-hour drive to Punakha, eastwards from Thimphu, over the Dochu La pass, provides a breathtaking panoramic view of the Bhutanese Himalayan range. For the winter months the central monastic body moves their quarters from the Tashichho Dzong in Thimphu to this dzong. Trongsa is situated in the central part of the country and the `dzong` here is, perhaps, the most interesting. The first view of the `dzong` on the drive from Punakha is dramatic : the `dzong` rides the steep green slopes of a ridge with multiple elevations built at various times in history. The Trongsa Dzong has been the seat of power for the eastern region and attained national significance, as in 1907 it was the Torongsa Penlop (governor) who has throned the hereditary ruler of the kingdom. Bumthang lies at a higher altitude in central Bhutan. It is a two-hour drive from Trongsa, and standing watch over the valley`s pink fields of buckwheat is Jakar Dzong. The sparsely populated valley of Bumthang is noted for the two monasteries of Kurjey and Jammpey Lhakhang, and is therefore, the destination for many pilgrims. Bumthang is well known for its `yatha` weaving. Out of local wool from yak and sheep, local weavers produce thick and colourful fabrics popularly used in jackets and as blankets and wall hangings. 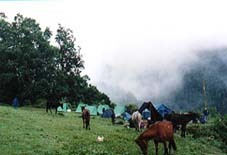 Trashigang represents one of the eastern most and populated districts. Traditionally most of Bhutan`s colourful and finest weavings come from this area. Echoing the government`s policy of balanced development, the nation`s only collage is located here at Kanglung. The drive to Trashigang from Bhumtan is one of the longest, lasting for 10 hours and crossing the highest point for motorable roads in Bhutan. Bae-Yul offers a wide range of treks varying in duration and difficulty. Our treks are generally classified into two groups: high altitudes and low altitude treks. High altitude treks generally demand a greater degree of physical fitness and are limited to certain seasons. Some of our popular ones are the Snow Man, Thousand Lakes, Druk Path, Beautiful Laya-Lingshi and Chomolhari. 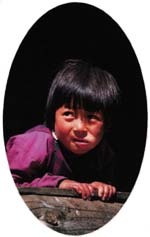 Trekkers in Bhutan enjoy the best there is to offer. Our trails pass through dense mountain woods, and alpine meadows carpeted with a profusion of spring colours; over exhilarating mountain passes with exquisite views in all directions; by numerous still glacier-fed lakes; and to remote peaks and the stark beauty of wilderness where blue sheep and tarkin range freely. To help you surmount the physical challenges of the trek and heighten the pleasure of it all, experienced Bae-Yul guides and campers are there to give you security and serve hot meals.